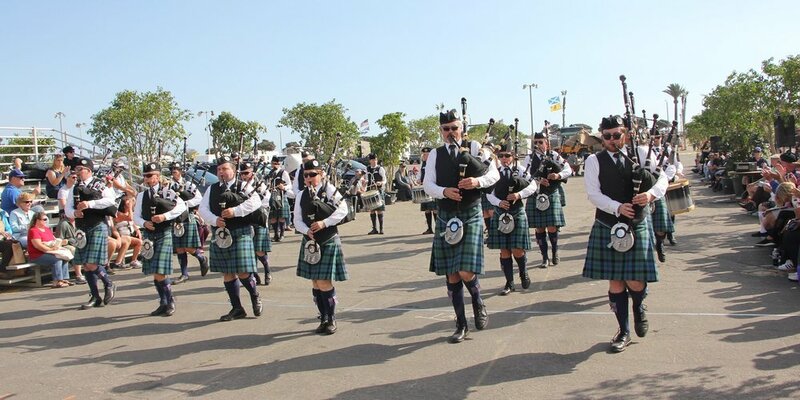 Founded in 1980, the Silicon Valley Pipe Band (SVPB), previously the Stewart Tartan Pipes & Drums, is a 501 (c) (3) non-profit organization created to educate the general public in piping, drumming, dance, and other art forms associated with Scottish and Celtic culture. We perform both publicly and privately, and instruct those interested in piping and drumming. To make a donation to support Scottish piping and drumming in the Silicon Valley, please visit our donations page. We offer parade, concert, and competition bands. Our culture is one of continual technical improvement coupled with a familial environment. Established performers and those starting their dedicated musical journey will find a home with us. We rehearse on Tuesday evenings at the St. Andrew's Episcopal Church in Saratoga. The calling of the pipes and drums adds an inspirational, and memorable touch to any event. We have performed at personal milestone celebrations, corporate events, community festivals, military/first responder ceremonies, major league professional sporting events, as well as accompanying The Chieftains at the Mountain Winery. The band was founded in San Francisco in January 1980 as the St. Peter's Highlander Pipe Band. The band changed the name to the Stewart Tartan Pipes & Drums in 1982. In 2018 the Stewart Tartan Pipes & Drums was officially reformed as the Silicon Valley Pipe Band under the direction of Pipe Major Adam Blaine. This change sought to renew and further the organization’s mission of cultivating the Scottish and Celtic arts in Silicon Valley. In support of its mission, the SVPB now aspires to become a top-notch competition band and attracting new piping and drumming talent.